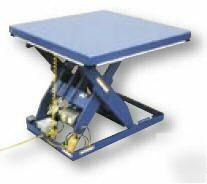 Electric hydraulic scissor lift 4,000 lb - 40"X48"
Subject: Electric hydraulic scissor lift 4,000 lb - 40"X48"
Safety features include: electric toe guard to protect pinch points during lowering of the table, brass velocity fuse to maintain platform height regardless of hydraulic pressure, 24V AC push-button hand control, maintenance prop, and upper travel limit switch to stop table at maximum height reducing motor wear. 2HP, 460V, 3 phase, 60 Hz totally enclosed motor standard, other voltages available. 3000 psi hydraulic component rating. Platform Size (WxL): 40" x 48"
* Frees up your working capital! * Apply your pre-approval to other listings if you do not win a listed item. Questions: Just send an email to or click on "Ask seller a question."